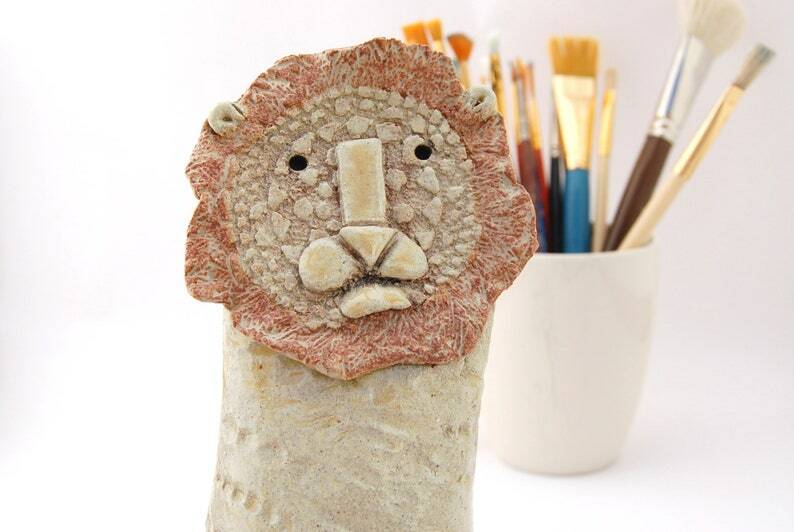 Ceramic Lion Sculpture - Tall Free Standing Stylized Lion Figurine - Textured Clay Big Cat Statue - Stoneware Pottery Male Lion "Arioch"
Arioch is a tall, slender, stylized ceramic lion sculpture hand built from textured stoneware clay slabs. Simplified shapes create his nose, mouth and chin over a round face and mane impressed with a doily and rubber stamps. His body was texturized with a straw handbag and plastic beaded bracelet, wrapped around itself and blended diagonally down the front. He was stained all over with a dark brown underglaze. He was lightly coated with oatmeal glaze that shows thicker, glossier application on his sprigged facial features. His mane and tail end are glazed with a matte shino. 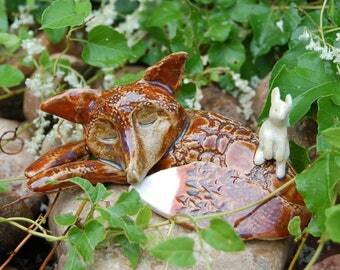 Arioch has a friendly face and measures 7.25 inches tall while sitting on a base of approximately 3.5 inches wide. His overall depth is 3.5 inches. Arioch is a delightfully unique piece to add to your lion collection, handmade with love and attention to detail. He is tall and sturdy, a fine specimen of the big cats that will blend seamlessly into any home decor. Ceramic Lion Sculpture - White Stoneware Textured Lion - Hand Built Pottery Stretching Lion Figurine - Small Reclining Lion Statue "Leopold"
Ceramic Lion Head Wall Decor - Wall Hanging Male Big Cat - Leo Zodiac Mask - Lion Face Wall Decoration - Textured Stoneware "Mustafa"
Ceramic Owl Sculpture - Stoneware Clay Figurine - Free Standing Owl Home Decor - Fine Art Bird Statue - High Fire Sculpture "Twisted Sister"
Porcelain Ceramic Rabbit Sculpture - Free Standing Hare or Bunny Statue - Hand Built Textured Primitive Rustic Rabbit Figurine - "Fennec"
Red Fox Blonde Bunny Ceramic Figurine - Woodland Pair Sculpture - Sleeping Fox Hand Built Statue - Fine Art Pottery "Frazier and Friend"
Ceramic Mixed Media Owl Sculpture - Acorn Cap Owlet Nestling - Mother and Child Statue - Mama and Baby Bird - "Almost Too Big For The Nest"